Being a pigeon owner means that you need to decide on which type of pigeon food that is best for your birds. One of the first things that you need to take into consideration is the breed of pigeon that you have. going to require special attention when it comes to their feeding if they are going to live long healthy lives and be productive. No matter if you are racing them or breeding them you need to pay special attention to just what you are putting in the food bowl. Although you may think that meat such as worms are going to be sufficient but you need to think again. These birds are special creatures and the better you feed them the better they are going to be. Wheat is the one thing that all types of food should contain regardless of the breed that you have. In reality, there should be a variety of different types of wheat in order for them to get the best of nutrition. There are also other ingredients that you should be looking for as well, depending upon the type of bird that you have. These include, dried field peas, hemp seed, maple peas, white millet, hard wheat, oat groats, and even canary grass. All of these ingredients are going to make up the best pigeon food that you could feed your birds. 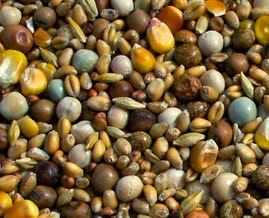 The mixture and the amounts of each ingredient are also very important to your birds overall health. When you are breeding them or using them for racing or carrying, you want to make sure that your birds can withstand the elements. You also need to ensure they are healthy and strong in order to win a race or to carry the message to its destination. The right amount of vitamins and minerals are going to take you and your birds a long way. Believe it or not, your birds are going to like the taste and even the texture of their food and they can be picky.